A third time he asked him, "Simon son of John, do you love me?" 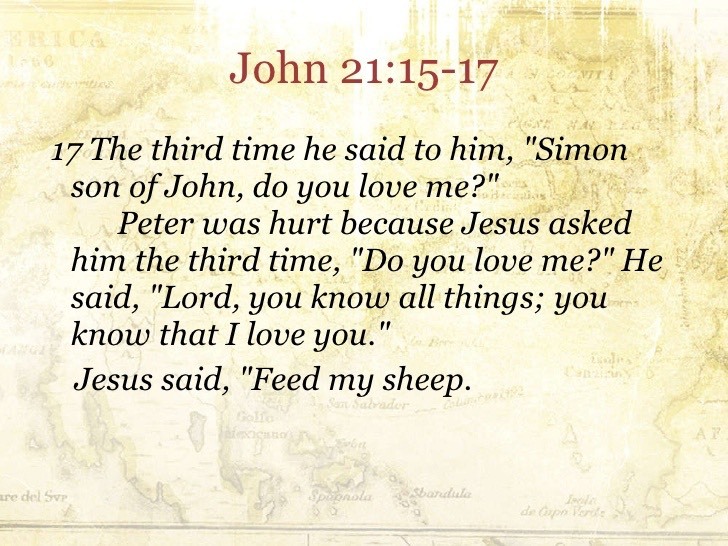 Peter was hurt that Jesus asked the question a third time. He said, "Lord, you know everything. You know that I love you." Jesus said, "Then feed my sheep. Isaiah 53— Every single line in this chapter richly describes Jesus, who is prophetically called the “Suffering Servant”— this is a detailed list of the redemptive work of Jesus, including taking our sins upon himself for those who have strayed( 2 Corinthians 5:21; Acts 8:32; and many other passages).